MAX THOMAS WINS IN A PLAYOFF! Astoria, NY: Max Thomas, a 59 year old engineer from Stamford, CT won LIGBT’s house shot tournament at Astoria Bowl by defeating James Marino, Lindenhurst, NY in a 2 frame roll off 39-33. The two bowlers finished the 10th frame with 243 which forced a 9th/10th frame roll off. Max earned $1,000 for his second LIGBT title while James took home $550 for second place. Finishing third was Shui Lee, Forest Hills, NY with a 235 worth $350 and fourth went to Mark Hulser, Ridgewood, NY with a 190 earning him $300. The final shootout was historic as it was the first time in 10 years the title had to be decided in extra frames. Shui took the early lead with 6 strikes in his first 7 frames but 2 late splits hurt his title hopes. James also started out strong with 5 strikes in his first 6 frames but followed that with 2 missed spares. Meanwhile Max was the only bowler without an open frame which kept him in the match. Going into the final frame James got up first and struck out for a 243. Max went next and needed a triple to beat James by 1 pin. Max got a double and 9 to tie James. Shui was the last bowler to finish and he needed a double and 9 to earn his first title. A stubborn 4 pin on his first shot cost him his first title and he had to settle for third place. The roll off was filled with a lot of pressure as a big crowd stayed to watch the finals. James got up first and struck. Max’s first frame in the roll off was a devastating one pin spare open. Now Max needed to finish the roll off with at least a double to force James to mark. He accomplished his goal with 3 perfect strikes. James threw a good shot in his final frame and left a 10 pin. Amazingly he missed it right which gave Max the surprising victory. The Astoria house shot event drew a nice crowd of 90 entries, advanced 16 bowlers to the finals and paid out $4,215. The cut scores on the house shot were higher than normal; 766 & 769 for the 49 & under age group and 762 & 732 for the seniors. High series of the tournament was shot by Matthew Pejovic, Long Island City, NY with an 851 in the 3pm squad. 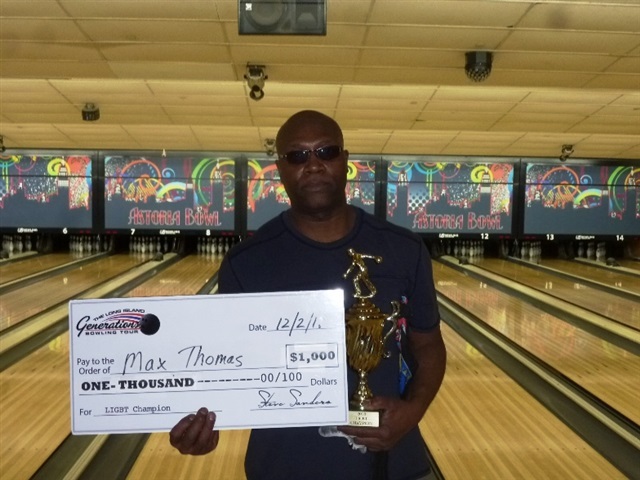 One bowler, Aaron Geddins, New York, NY earned a $75 cashing spot due to the “no division” insurance. LIGBT’s next tournament is our annual Holiday Tournament at AMF Babylon. This 3-squad sport shot event will take place on Sunday, December 9th and feature guaranteed top prizes of $1,500-$750-$500-$300 and 1 in 6 advancing to the finals. To view the final results of the Astoria Bowl event please visit www.ligbtour.com. The LIGBT is sponsored by Kegel, Knockout Ball Cleaner, Torch Bowling, Billvee Electric, & Vietri Associates.